“What’s the best coffee machine for home use?” This is a common question. The answer, for most people, is a capsule coffee machine of some sort – also sometimes referred to as a Pod coffee machine. Here we’ll take you through some buying advice as well as list the best capsule coffee machines you can buy in the UK in 2018. You can find a great capsule coffee machine on any budget! Capsule coffee machines are great for home use because they’re easy to use, require very maintenance and make no mess. Just fill your machine with water, insert a capsule, then press a button and you’ll have a tasty espresso in seconds. The high-end coffee capsule machines tend to be a little larger than the budget machines. This is because they opt for larger water reservoirs and come with built-in automatic milk frothers. They are designed to make milk-based coffees such as lattes or cappuccinos at the touch of the button. The mid-range models often have similar or slightly smaller water reservoirs, but only come with a milk wand, or no milk steaming functionality at all. Making an espresso is no different to the high-end machine, you enter your capsule and press a button. The difference is you have to steam your milk separately and manually pour it on top of your espresso to make a Flat White, Latte or Cappuccino. This is the most popular type of capsule coffee machine. At the cheaper end of the scale, you have capsule coffee machines that make entire drinks from a single capsule. They use powdered milk and make lattes or cappuccinos entirely by combining hot water with the contents of the capsule. What espresso BAR Pressure do I need? Buyers tend to get confused by what BAR pressure machine they should be looking for. What this means is the PSI hot water is forced through the coffee at. It’s understandable to assume the higher the better, but it’s not as simple as that. It’s complicated by the volume of water and thickness of coffee grind. Take a look at our page on What does espresso BAR pressure mean? to find out more. Our advice is to put it to the back of your mind when buying a capsule coffee machine. If you invest in a quality brand, it will have performed its due diligence in labs and worked out the optimum espresso BAR pressure for each individual machine and capsule. Before you decide on the best capsule coffee machine for your home, here is a quick checklist of features to look out for. Prioritise which features are most important to you and see which machines fit your requirements below. Does it have an automatic milk steamer or manual milk wand? How expensive are the capsules? 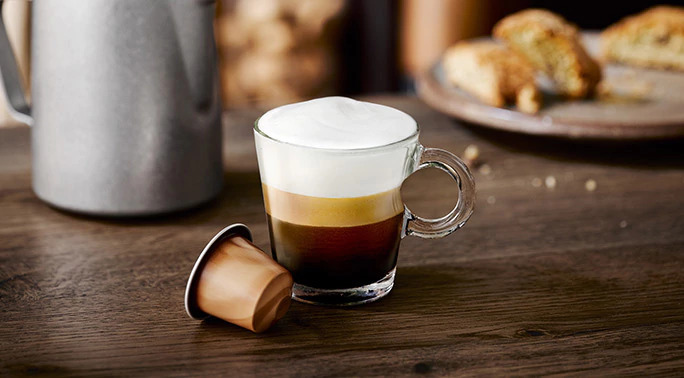 The Krups Nespresso Expert Coffee & Milk Machine has combined the functionality coffee drinkers need, with the style and sophistication they want. Its high-quality coffee, customisable options and multi-functional Aeroccino3 frother all under a respectable price tag means it’s the best on the market right now. Click here to read our full Nespresso Expert Coffee & Milk Machine by Krups review. There’s a lot to like about the Nespresso VertuoPlus. Its design is beautiful and it’s very easy to use. Combine this with its reasonable price fantastic end result (the coffee) and it becomes a capsule coffee machine that will benefit a lot of kitchens. Click here to read our full Nespresso VertuoPlus by Krups review. Click here to read our full Nespresso Prodigio by Krups review. Click here to read our full Nespresso CitiZ & Milk Coffee Machine by Magimix review. The Nespresso KitchenAid Artisan coffee capsule machine is all you’d expect when combining these two powerhouse appliance brands. This machine guarantees style and quality coffee. It’s not cheap (or small), but the Nespresso KitchenAid Artisan makes high-quality coffee while looking good. Click here to read our full KitchenAid Nespresso Artisan review. The Nespresso Lattissima One is a gorgeous and slim capsule coffee machine that couldn’t be easier to use. It’s just as easy to maintain too. If you want to make a quick Nespresso coffee at the press of a button, there isn’t a coffee machine that rivals this for convenience. However, there is little original in this machine that warrants its mid-range price tag apart from its new “no waste” milk jug. Apart from that, Nespresso itself has better and/or cheaper capsule coffee machines than the Lattissima One. But for convenience alone, there is no better coffee machine than this. Read our full Nespresso Lattissima review. 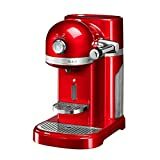 Click here to buy the Nespresso Lattissima One. Click here to read our full Nescafe Dolce Gusto Oblo Coffee Machine by Krups review. De’Longhi have paved the way for a new generation of uniquely designed coffee capsule machines with its Nescafe Dolce Gusto Eclipse. If you want your machine to stand out instead of fitting in, while making high-quality coffee, this is the perfect unit. 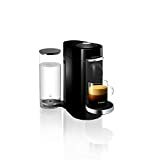 But if you are more interested in the coffee, and would rather a machine that will blend in with other appliances, there are cheaper machines of the same quality available. Click here to read our full De’Longhi Nescafe Dolce Gusto Eclipse Touch review. If you aren’t a coffee connoisseur but are looking for a simple, easy-to-use machine that will make a good cup of coffee, the Bosch Tassimo Vivy is ideal. Its small size and price make it one of the best, affordable machines on the market. While it isn’t made to razzle-dazzle, it does the job. Click here to read our full Bosch Tassimo Vivy review. See also: Best bean-to-cup coffee machines 2018.